(SPUZZUM, B.C.) They were building bridges as well as saving them at two community heritage events in the historic Fraser Canyon. A coalition of First Nations representatives, heritage organizations, community activists, officials from all three levels of government and other supporters gathered to celebrate the opening of the Grand Opening of the Tikwalus Trail in Spuzzum and take action to restore the Alexandra Bridge at a meeting in Hope. The trail opening, held April 20 at the trailhead just north of Alexandra Lodge, saw 100 people from Vancouver, Harrison, Chilliwack and Hope and even Ottawa gather in the traditional territory of the Spuzzum First Nation. It marked the completion of a $98,000 project to restore a 12-kilometre loop on Lake Mountain. 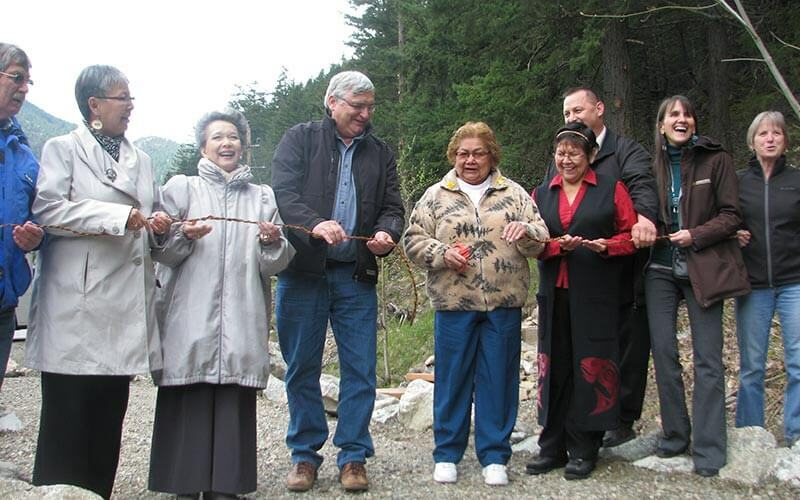 Organized by the Alexandra Bridge Project partners, the events featured the cutting of a traditionally woven cedar bark ribbon to open the trail. The geocaches along the trail were symbolically activated by Senators Lillian Quan Dyck and Vivienne Poy, two prominent members of the Chinese-Canadian community touring historic sites of the Lower Fraser Canyon. Hosted by Spuzzum First Nation Chief Jim Hobart, the festive gathering heard from speakers like Spuzzum elder Marion Dixon, who spoke movingly about having been raised in the area. Archaeologist Michael Klassen spoke of the trail’s significance to the First Nations people and described some of its heritage assets, including the site of a gold rush era road house. Historian, educator and heritage trail advocate Charles Hou shared some of his memories of hiking the trail, its use by the Hudson’s Bay Company with help from the First Nations, and spoke of the need to do more to restore and promote trails throughout the Fraser Canyon. A joint project of the New Pathways to Gold Society (NPTGS), Spuzzum First Nation and Hope Mountain Centre, the Tikwalus Trail is part of the NPTGS Heritage Trails Program, which is funded provincially by the Ministry of Jobs, Tourism and Investment. Federally, NPTGS has received funds from Western Economic Diversification Canada, Canadian Heritage and the National Trails Coalition. The Tikwalus Trail project is also part of a larger initiative to restore Alexandra Bridge Provincial Park and its environs, creating a world-class heritage tourism asset that will benefit all British Columbians. The Alexandra Bridge Project is a partnership between the lead organizations (NPTGS, Spuzzum First Nation and Hope Mountain Centre) and local businesses, government and heritage organizations. Nearly 50 people turned up at the Hope Recreation Centre on by-election night last Thursday (April 19) to give their input into plans to restore Alexandra Bridge, as well as Alexandra Bridge Provincial Park. The meeting heard how the 1926 Alexandra Bridge structure – maintained by the Ministry of Transportation and Infrastructure – can safely carry pedestrian traffic for another 15 years. Discussion on the draft site concept plan developed by the project partners centered on improvements to the park’s amenities (like the highway rest stop), access to the bridge across the CN line, and a proposed camp site and interpretive centre.